The Department of Justice started pressuring Swiss Banks including UBS and Credit Suisse to reveal bank account information on their account holders who are U.S. citizens or U.S. residents. From their success in 2004 to crack open the Swiss banks, the U.S. government passed legislation in 2010 known as the Foreign Account Tax Compliance Act (“FATCA”). Following the mandate of (FATCA, U.S. tax authorities and foreign governments have entered into agreements known as Intergovernmental Agreement (IGA) to share financial data about each of their citizens. FATCA came into full effect on July 1, 2014 and has now become a huge tool for IRS as part of a crackdown on tax dodging by wealthy Americans requiring foreign financial institutions to disclose to the IRS more about Americans’ Offshore accounts. For any foreign financial institution that fails to comply, the stakes are high as that entity will be frozen out of U.S. capital markets. Information from the Swiss Banks and other European Banks has now been flowing to IRS and is being used by IRS to uncover taxpayers who have not disclosed foreign income and foreign accounts. The IRS is now aggressively supplementing and corroborating prior leads, as well as developing new leads, involving numerous banks, advisors and promoters from around the world, with a new emphasis in Asia, India, Israel and the Middle East pressuring banks like HSBC and others to reveal U.S. accountholder information. We can assist with IRS tax problems, get you in compliance with your FBAR filing obligations, and minimize the chance of any criminal investigation or imposition of civil penalties. The IRS has established a Special Unit to disseminate bank information received from foreign banks and compare it to the forms and information reported by U.S. taxpayers on their tax returns. In addition, this Unit is able to review previously filed FBAR’s to determine whether all income was reported on each income tax return. Starting in 2011, taxpayers who have foreign assets will be required to disclose those assets with the filing of their Federal Individual Income Tax Return. This reporting which is made on Form 8938, Statement of Specified Foreign Financial Assets, will serve as an additional tool for this Unit. In advance of the expected large wave of enforcement to be commenced by IRS, the IRS had established programs for taxpayers to voluntarily come forward and disclose unreported foreign income and foreign accounts. Delinquent international information return submission procedures. Since September 28, 2018, the IRS discontinued the Offshore Voluntary Disclosure Program (OVDP); however, on November 20, 2018 the IRS issued guidelines by which taxpayers with undisclosed foreign bank account and unreported foreign income can still come forward with a voluntary disclosure. The voluntary disclosure program is specifically designed for taxpayers with exposure to potential criminal liability and/or substantial civil penalties due to a willful failure to report foreign financial assets or foreign in income. For all voluntary disclosures received after September 28, 2018, the IRS will apply the civil resolution framework outlined below. In general, voluntary disclosures will include a six-year disclosure period. The disclosure period will require examinations of the most recent six tax years so taxpayers must submit all required returns and reports for the disclosure period. Except as set forth below, the civil penalty under I.R.C. § 6663 for fraud or the civil penalty under I.R.C. § 6651(f) for the fraudulent failure to file income tax returns will apply to the one tax year with the highest tax liability. For purposes of this memo, both penalties are referred to as the civil fraud penalty and carries a penalty rate of 75% against the amount of increase in tax. In limited circumstances, the IRS may apply the civil fraud penalty to more than one year in the six-year scope (up to all six years) based on the facts and circumstances of the case, for example, if there is no agreement as to the tax liability. The IRS may apply the civil fraud penalty beyond six years if the taxpayer fails to cooperate and resolve the examination by agreement. Willful FBAR penalties will be asserted in accordance with existing IRS penalty guidelines under Internal Revenue Manual Sections 4.26.16 and 4.26.17. A taxpayer under this voluntary disclosure program is not precluded from requesting the imposition of accuracy related penalties under I.R.C. § 6662 (which carries a penalty rate of 20%) instead of civil fraud penalties or non-willful FBAR penalties instead of willful penalties (both of which are much higher). Additionally, taxpayers can appeal an agent’s determination to the IRS Office Of Appeals. That being the case, hiring qualified tax counsel experienced in voluntary disclosure early on should increase the chances of securing a lower penalty amount. The streamlined filing compliance procedures are available to taxpayers certifying that their failure to report foreign financial assets and pay all tax due in respect of those assets did not result from willful conduct on their part. The streamlined procedures are designed to provide to taxpayers in such situations (1) a streamlined procedure for filing amended or delinquent returns and (2) terms for resolving their tax and penalty obligations. Taxpayers will be required to certify that the failure to report all income, pay all tax, and submit all required information returns, including FBARs (FinCEN Form 114, previously Form TD F 90-22.1), was due to non-willful conduct. If the IRS has initiated a civil examination of a taxpayer’s returns for any taxable year, regardless of whether the examination relates to undisclosed foreign financial assets, the taxpayer will not be eligible to use the streamlined procedures. Similarly, a taxpayer under criminal investigation by IRS Criminal Investigation is also ineligible to use the streamlined procedures. Taxpayers eligible to use the streamlined procedures who have previously filed delinquent or amended returns in an attempt to address U.S. tax and information reporting obligations with respect to foreign financial assets (so-called “quiet disclosures” made outside of the OVDP or its predecessor programs) may still use the streamlined procedures. The Streamlined Procedures are classified between U.S. Taxpayers Residing Outside the United States and U.S. Taxpayers Residing in the United States. Certify that the failure to report the income from a foreign financial asset and pay tax as required by U.S. law, and failure to file an FBAR (FinCEN Form 114, previously Form TD F 90-22.1) with respect to a foreign financial account, resulted from non-willful conduct. Non-willful conduct is conduct that is due to negligence, inadvertence, or mistake or conduct that is the result of a good faith misunderstanding of the requirements of the law. Calculate interest each year on unpaid tax. Waiver of other fraud and filing penalties including IRC Sec. 6663 fraud penalties (75% of the unpaid tax) and failure to file a TD F 90-22.1, Report of Foreign Bank and Financial Accounts Report, (FBAR) (the greater of $100,000 or 50% of the foreign account balance). Waiver of any OVDI penalty. Non-residency requirement applicable to individuals who are U.S. citizens or lawful permanent residents (i.e., “green card holders”): Individual U.S. citizens or lawful permanent residents, or estates of U.S. citizens or lawful permanent residents, meet the applicable non-residency requirement if, in any one or more of the most recent three years for which the U.S. tax return due date (or properly applied for extended due date) has passed, the individual did not have a U.S. abode and the individual was physically outside the United States for at least 330 full days. Under IRC section 911 and its regulations, which apply for purposes of these procedures, neither temporary presence of the individual in the United States nor maintenance of a dwelling in the United States by an individual necessarily mean that the individual’s abode is in the United States. Non-residency requirement applicable to individuals who are not U.S. citizens or lawful permanent residents: Individuals who are not U.S. citizens or lawful permanent residents, or estates of individuals who were not U.S. citizens or lawful permanent residents, meet the applicable non-residency requirement if, in any one or more of the last three years for which the U.S. tax return due date (or properly applied for extended due date) has passed, the individual did not meet the substantial presence test of IRC section 7701(b)(3). Apply a 5% penalty based upon the highest balance of the account in the past six years. Taxpayers who do not need to use either OVDP or the Streamlined Filing Compliance Procedures to file delinquent or amended tax returns to report and pay additional tax, but who (1) have not filed a required Report of Foreign Bank and Financial Accounts (FBAR) (FinCEN Form 114, previously Form TD F 90-22.1), (2) are not under a civil examination or a criminal investigation by the IRS, and (3) have not already been contacted by the IRS about the delinquent FBARs can file the delinquent FBARs with a statement explaining why the FBARs are filed late. Be aware that the IRS has discretion whether to abate penalties for the failure to file the delinquent FBARs. To qualify for this relief you must have properly reported on your U.S. tax returns, and paid all tax on, the income from the foreign financial accounts reported on the delinquent FBARs and you have not previously been contacted regarding an income tax examination or a request for delinquent returns for the years for which the delinquent FBARs are submitted. Taxpayers who do not need to use either OVDP or the Streamlined Filing Compliance Procedures to file delinquent or amended tax returns to report and pay additional tax, but who (1) have not filed one or more required international information returns, (2) have reasonable cause for not timely filing the information returns, (3) are not under a civil examination or a criminal investigation by the IRS, and (4) have not already been contacted by the IRS about the delinquent information returns can file the delinquent information returns with a statement of all facts establishing reasonable cause for the failure to file. As part of the reasonable cause statement, taxpayers must also certify that any entity for which the information returns are being filed was not engaged in tax evasion. If a reasonable cause statement is not attached to each delinquent information return filed, penalties may be assessed in accordance with existing procedures. 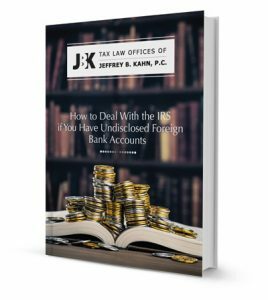 Recent closure and liquidation of foreign accounts will not remove your exposure for non-disclosure as the IRS will be securing bank information for the last eight years. Additionally, as a result of the account closure and distribution of funds being reported in normal banking channels, this will elevate your chances of being selected for investigation by the IRS. For those taxpayers who have submitted delinquent FBAR’s and amended tax returns without applying for amnesty (referred to as a “quiet disclosure”), the IRS has blocked the processing of these returns and flagged these taxpayers for further investigation. You should also expect that the IRS will use such conduct to show willfulness by the taxpayer to justify the maximum punishment. Additionally, starting with the 2011 Tax Return Filing Season: U.S. taxpayers who have an interest in foreign assets with an aggregate value exceeding $50,000 must include new Form 8938 (Statement of Specified Foreign Financial Assets) with their Federal income tax return. This reporting will serve as an additional tool for the IRS to determine prior noncompliance of taxpayers who have undisclosed foreign accounts or unreported foreign income. The new Form 8938 filing requirement does not replace or otherwise affect a taxpayer’s obligation to file an FBAR (Report of Foreign Bank and Financial Accounts). Failing to file Form 8938 when required could result in a $10,000 penalty, with an additional penalty up to $50,000 for continued failure to file after IRS notification. A 40% penalty on any understatement of tax attributable to non-disclosed assets can also be imposed. If the IRS has already selected you for an audit or you are being investigated, these programs are not available to you. To find out how you must now protect yourself, click here. Click here for FAQ’s on applying for amnesty. For those taxpayers who have filed for amnesty and are having difficulty with their case or do not have the confidence in their representative to secure the best possible result, we offer a service whereby we would evaluate your case and discuss your options. We have found that the Revenue Agents working these cases have made errors that favor the IRS. Let our experience work for you to avail you of the benefits of this amnesty program with the lowest liability possible. Contact an IRS lawyer today. Given the wealth of foreign account information released to the IRS and the IRS’ expansion of resources to enforce compliance, this may be the last opportunity for taxpayers to resolve unreported foreign income issues without criminal prosecution. Once the IRS has commenced an investigation, a taxpayer cannot enter into a Voluntary Disclosure Program. We recommend that taxpayers in this situation act immediately and seek assistance from an IRS attorney with expertise in the Voluntary Disclosure Program for undisclosed foreign accounts. For prompt evaluation of your case, we encourage you to contact us using our toll-free number at 866.494.6829.